Today in South Australia our most significant ‘ham fest’ takes place which is organised by the Adelaide Hills Amateur Radio Society Inc. Many South Australian amateurs make their way to the Goodwood Community Centre. So do some from interstate: amateur suppliers and specialists with their cars and trailers loaded up with ‘goodies’. The motivations for the pilgrimages are varied: for some it is to purchase a new transceiver or a desirable bit of extra gear for the shack. For others it is to carefully search out someone’s no longer wanted items for something that will find a new home with a new owner. For others it is to share a special interest, for example, SOTA; DStar or the VK5 National and Conservation Park award and try and win others to these special interests. And for still others it is a social event frequently followed by lunch at a local eating house! I normally make this pilgrimage! This time I could not go. I was required in Clare to play with the Payneham Community Band. We all had a great time on Saturday evening with the local community band. But Sunday was free. I decided I would indulge my amateur radio interest with some visits to parks and one Sota summit. I selected two parks near Clare. 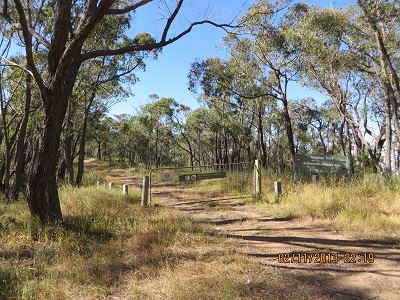 Spring Gully Conservation Park is about 12 kilometres south of Clare. It conserves a beautiful section of local bush, 96 hectares, in an area otherwise used for grazing, cropping and known for riesling and shiraz, among many varieties, the famed Clare wine region. I enjoyed seven contacts: at 22:46 I called CQ and my call was answered by VK5EE, Tom from Mount Gambier; VK5YCP, Chris; VK2AWJ/ QRP, Gol Gol using a KX3; VK3AFW, Ron; VK5FMID, Brian; VK3MRG/p QRP, Marshall on VK3 VN-009 and VK5HS, Ivan, and completing seven contacts before UTC rollover. It was a magnificent morning, sunny and warm and I listened to the WIA broadcast and the local club news and tried to join the call back on 7.135 Mhz. Although local signals were 5 and 9 from Adelaide, none of the Adelaide stations could hear me. It is really a waste of time trying to get heard operating QRP, with such high noise levels for many city stations. 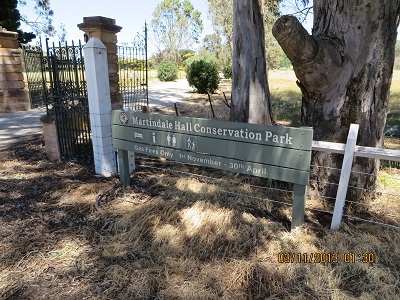 After a little over an hour I decided I would dismantle my station and head for Martindale Hall Conservation Park. 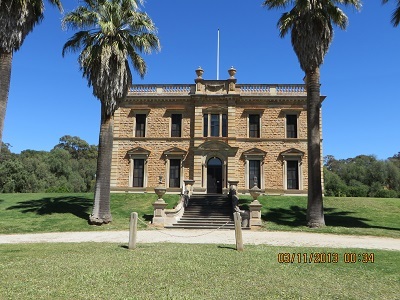 The mansion is not far from the heritage village of Mintaro in the beautiful Clare Valley. 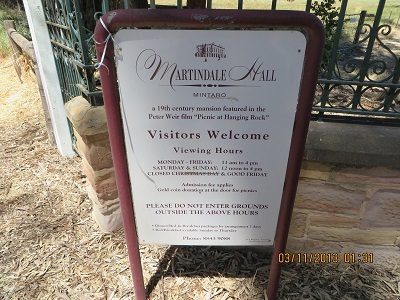 Martindale Hall became well known to film goers in 1975 when it was used in Peter Weir’s successful Australian film Picnic at Hanging Rock. There is plenty of material about Martindale Hall on the web and the mansion now functions as a boutique hotel. Opening hours on a Sunday are from 12.00 noon to 1600 hours. I arrived soon after 1100 hours, the weekday opening time. I took a few pictures and set up my station near some trees within the parking area about 150 metres from the mansion. One visitor asked my what I was fishing for: I said radio waves! However, there were not too many about on 40 metres at that time. Propagation had changed for the worst and signals were attenuated but I still managed three contacts: at 00:54, VK2HF/3, Geoff near Swan Hill; VK5WG, Nev and VK5EE, Tom. I then packed my gear and drove to Auburn for some lunch and then down the Main North Road to Gawler before taking secondary roads to Mount Gawler. I used my vehicle based GPS to navigate from the Clare Valley through the town of Gawler and on to Mount Gawler. I visited parts on SA, especially around Gawler, that I have never seen before! I then used the Country Fire Service maps to confirm that I had indeed found Mt Gawler. These maps are 1:50 000 and show Mount Gawler being about half way between Airstrip and Richardson Roads on Mount Gawler Road. The map even shows a symbol for the trig point (located on private property just a few metres from the road). Here are the coordinates and altitude measures: 34.78054 138.81216; DMS 34º 46′ 49.95″ S 138º 48′ 43.79″ E; Altitude 543.48m. I did quite a bit of looking around on foot and parked my 4 x 4 in a safe place and carried my gear to the activation point. While I had to move around the 40 metre band a little to secure contacts, I finished with 10 in the log, a reasonable effort given the buy and sell. At 05:05 my first contact was with VK5NWE, Roger; VK5FACE, Andrew; VK5FMID, Brian and then VK5TW, Trevor, making four contacts. Up until this point the going was very slow and propagation poor. I then had contacts in fairly rapid succession with VK5EE, Tom; VK5NFB, Don; VK5CZ/m, Ian driving home from the buy and sell; VK5PAS, Paul; VK3EO, Tom at Swan Hill and VK3GFS/ QRP, Frank at Mount Evelyn.